The coat o airms o the Princely Hoose o Liechtenstein is an aa uised as the great airms o the naition. As the sovereign emblem o the Principality o Liechtenstein, its uise is reserved for the members o the Princely Hoose an state authorities. Private individuals mey be authorized tae uise the great airms, if it is in the interest o the State. The airms are a history o the Princely Hoose, an shaw the mony different auries o Europe wi which Liechtenstein haes been involved, either bi conquest or bi marriage. The first quarter is Silesie; the seicont is the airms o the Kuenring faimily; the third quarter, the Duchy o Troppau; an the fowerth quarter, the airms o the East Frisian faimily Cirksena representin Coonty o Rietberg. The base is occupied bi the airms o the Duchy o Jägerndorf. The sma gowd an reid shield o the Princely Hoose is shawn in the middle o the lairger shield. The Princely hat crouns a purpie cloak wi ermine linin ahint the lairge coat-o-airms. Housomeivver, when the faimily shield is uised as the sma naitional coat-o-airms the hat rests directly on the tap o the shield. The whole achievement (entire renderin wi supporters) is surroondit bi the Princely cloak, or mantle, Purpure an lined Ermine an ensigned wi the Princely hat. 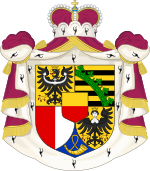 Wikimedia Commons haes media relatit tae Coats of arms of Liechtenstein. This page wis last eeditit on 23 Apryle 2017, at 03:37.